India is the number one producer of silk in the world for which there is a huge demand both in the national as well as international markets. Different varieties of silk are reared based on climatic and geographic conditions of which only four namely Tassar,Eri, Mulberry and Muga are the prominent ones. Tassar and Muga are wild varieties of silk cultivated by silk worms fed on organically grown trees. Bihar, Assam and Chattisgarh are the States are the three States where Tassar and Muga are produced. “Hastashilpi” – organized 10 days ‘Silk India -2015’ at Valluvar Kottam, Nungambakkam, Chennai Expo (from 23.10.15 to 01.11.15.) 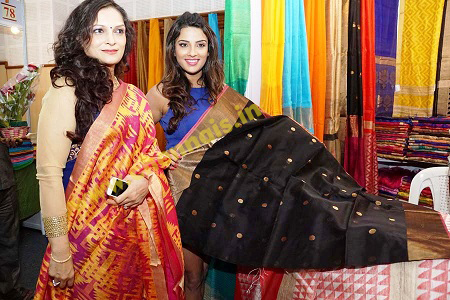 “Various Silk Saree Weavers, Handloom Clusters and Silk Co-operative Societies showcasing their products in exposition, The intension of the organization is to make accessible and attain the products directly to the customers, without the moderator to the weavers and artisans’’ said, Hastashilpi organizer T.Abhinand. 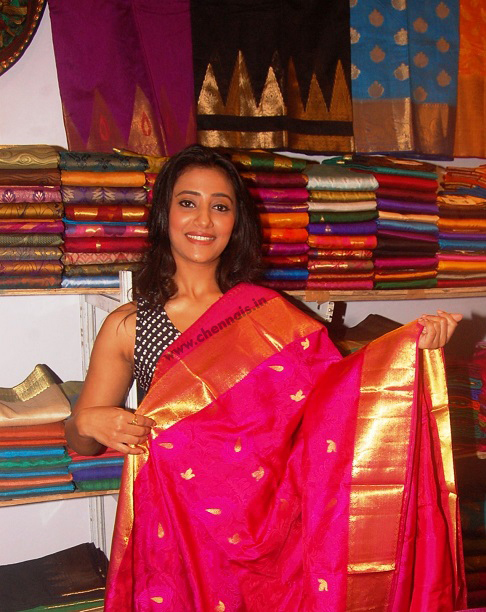 “Arini Silk Saris, Crepe & Georgette Silk Saris, Chiffon Silk Saris, Tassar silk sarees and Suit, Kanjeevaram Silk Sarees & Wedding Saris, Designer fancy Saris, Darmavaram SilkSaris, Raw Silk & Tassar, Jute Silk Saris, Dhaka Silk Saris, Handloom Silk Cotton Saris,Silk Blends Saris & Stole, Silk Shawls, Uppada, Gadwal, Paithani Sarees, Mangalagiri &Pochampalli Silk Saris and much many more products through out country in this silk Many more silk products… Hand Block Print Saris, Suit & Silk Bed Covers, Designer dress materials & Border, Lazes, Kurtis, Hand Woven Matka & Assam Muga Fabrics, Apoorva Silk Saris, Baluchari,Dhaka Masli, Gicha Saris, Boutique Saris, Kantha Saris, Zordoshi, Lucknow Chikan Work Sarees, Bhagalpur suits, Printed Silk Saris, Banarasi Sarees, Reshmi plain and Butti saris, Maheswari, Chanderi Silk Saris & Suit and Kota silk, Mulberry silk with temple border, Banaras Jamdani, Hand-woven saris will on display.